Canadian singer Avril Lavigne will spend the last day of 2011 with fans in China. Lavigne will headline a star-studded concert held by China's Jiangsu Satellite TV to mark the arrival of the New Year, the broadcaster has announced. The show will be held on December 31 in the city of Nanjing where Jiangsu Satellite TV has its headquarters. Lavigne will arrive in China on December 30, according to the show's chief director, Zhang Yedi. The show's lineup also includes Chinese music heavyweights Jonathan Lee and Wakin Chau, as well as pop stars Nicholas Tse and Rene Liu. As China's regional TV stations compete for audience ratings, inviting international stars to their New Year's galas has become a common practice. Last year, Jiangsu Satellite TV claimed to have invited Scottish singing sensation Susan Boyle, who failed to show up in the end. Earlier this afternoon, Avril hinted that she was doing something "REALLY cool" and "secret". Now we know that that meant a duet with X Factor USA finalist Chris Rene. The 2 sang Complicated, with a little twist. Great performance by Avril, she looks so happy to be there! WYWH FAN EDITION PICTURES - NO "HELLO" SONG!!! NO "HELLO" like previously advertised!!!!!! 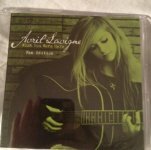 She also got an autographed "Goodbye Lullaby", where they said that 100 people would get an autographed postcard. P.S. Check out this link to see if your name is on the poster! Avril was spotted Christmas shopping in Los Angeles on Friday. TOPPING THE BILLBOARD CHART WITH "GIRLFRIEND"
Avril appeared on NBC's Talk Stoop while she was in New York a few weeks ago and gave an interview about Goodbye Lullaby, her career, her favorite word, her future in the music industry, and a performance of Wish You Were Here, Girlfriend, and Smile. By the way, numerous people have been getting emails to say that their Wish You Were Here Fan Edition CD has shipped, so we will be hearing Hello very soon! Avril managed to come in as the #3 'most liked' star with the fastest growing page on Facebook in 2011. She was only beat out by Rihanna and Bob Marley, while she easily gained more Facebook likes this year than Lady Gaga, Justin Bieber, The Black Eyed Peas, and more! Great accomplishment and thanks to everyone for 'liking' Avril! Now can we get the same response for her Twitter? Avril performed at XL'ent Xmas in Orlando, FL last night. This was the final on stage performance for Avril in 2011! Avril performed at Y100's Jingle Ball in Miami, FL last night.